It’s official – the Pittsburgh Penguins will play the San Jose Sharks in the 2016 Stanley Cup Final. The Penguins solidified their berth with a 2-1 win over the Tampa Bay Lightning in Game 7 Thursday night, just one day after the Sharks took down the St. Louis Blues in Game 6 of their respective Conference Finals series. 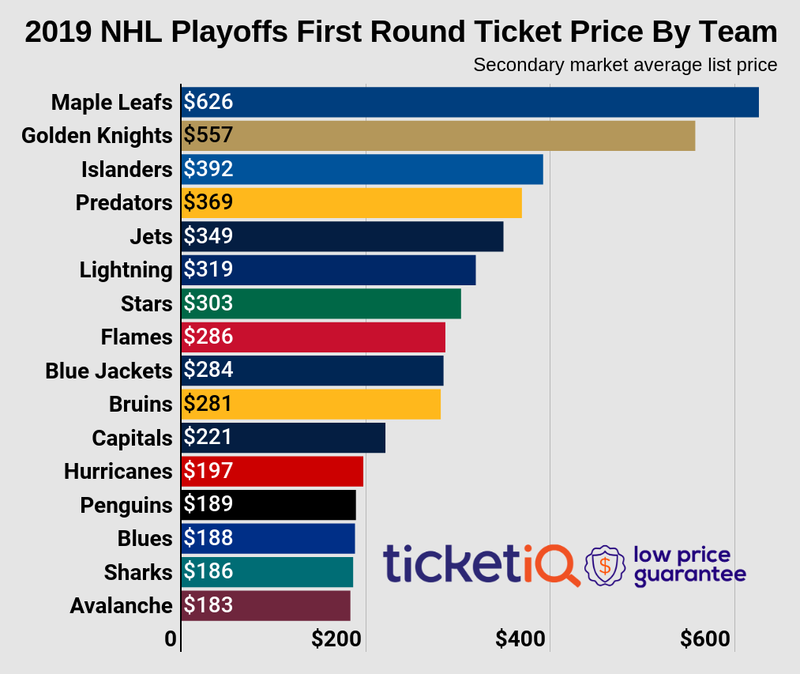 The two teams will meet for the first time on the NHL’s biggest stage, and while excitement quickly builds for the best-of-seven series, ticket prices on the secondary market have yet to follow. According to TicketIQ the series average for 2016 Stanley Cup Final tickets is now $958.52. That makes it the cheapest Stanley Cup Final on average since at least 2011. Only one other championship round in that time failed to break the $1,000 threshold across its seven-game series. That was in 2012, when the Los Angeles Kings and New Jersey Devils owned a $994.58 average over a six-game stretch. The Stanley Cup Final will return to Pittsburgh for the first time since 2009, but with the Sharks skating in their first-ever title series, ticket prices will be considerably more expensive in San Jose. Game 1 of the 2016 Stanley Cup Final will be held on Monday, May 30 at Consol Energy Center in Pittsburgh. It will be the cheapest game of the series, with Penguins Stanley Cup tickets averaging $624.39 and the get-in price starting from $363. Game 2 on Wednesday will be slightly more expensive on average at $695.66, though the cheapest ticket is currently $340. The series shifts to SAP Center for Games 3 and 4 on June 4 and 6, respectively. With the Sharks hosting their first-ever Stanley Cup Final game, Game 3 tickets will be among the most expensive of the series at an average resale price of $1,140.83.  Don't expect to get in cheap, as the get-in price is now $870. That makes it the most expensive game to attend if looking to just get past the gates and into the arena. Sharks Stanley Cup tickets own similar price points for Game 4, with tickets averaging $1,021.08 and the get-in price starting from $812. Should the series extend to a Game 5 back in Pittsburgh, tickets will continue to exceed the $1,000 average on the secondary market. 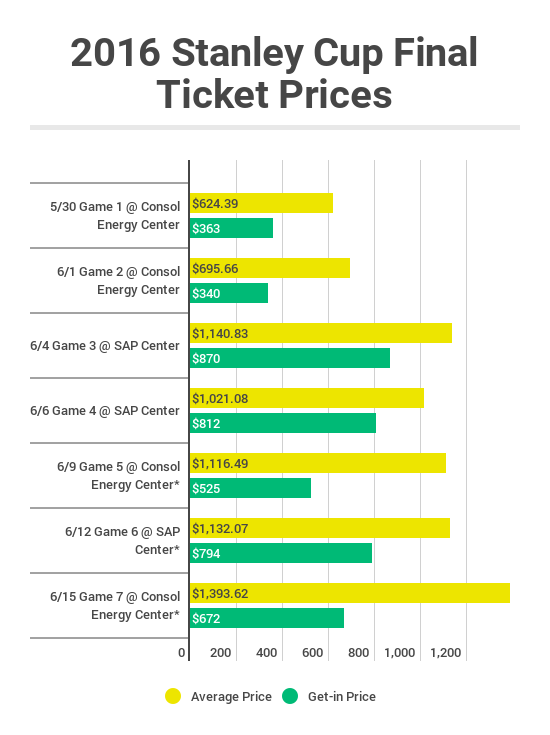 A Game 6 in San Jose would be the second most expensive game at SAP Center, with tickets averaging over $1,100. A decisive Game 7 would be the most expensive game of the series on average at $1,393. The cheapest ticket is now $672. The Penguins are looking to bring Lord Stanley back to the Steel City for the first time since 2009. It will be the team's fifth Stanley Cup Final appearance in franchise history, having won three of their four previous series. The Sharks have never played on this far into the postseason, losing three Conference Finals dating back to the 2003-04 NHL season.